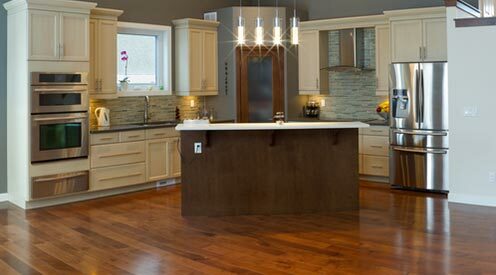 Family Hardwood Floors has been the premier hardwood specialist in Springfield, MO for over 40 years. We deliver only the highest quality service, products and craftsmanship in every project. If you’ve been looking for beautiful hardwood flooring, you can count on us to meet your every need. Hardwood floors give a room a sense of stability and warmth. Ninety percent of realtors say that hardwood floors help increase the value of your home and help it sell more quickly. Even in a small home with minimal square footage, hardwood floors give a home a well-crafted, sophisticated appearance. Our hardwood floors in Springfield, MO come in a wide variety of different species and colors, making design possibilities endless! We are proud of the high quality of service, product and craftsmanship that we deliver in every hardwood flooring installation in Springfield, MO. All of our services are offered conveniently on site. We have a wide range of services that will meet all of your hardwood needs.